Weavers Guesthouse01535 643209work01535 642509fax Guest AccommodationAccredited with 4 star guest accommodation ratings by both Enjoyengland and the AA, Weavers Guesthouse is the perfect place to stay to use as a base for exploring this beautiful part of the country. 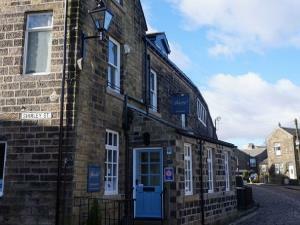 A stones-throw from the Bronte Parsonage Museum and the historic cobbled Main Street, Weavers Guesthouse offers modern and stylish Bed and Breakfast accommodation. All rooms are individually styled and designed with modern facilities yet retaining the traditional character associated with Haworth and the Brontes. Luxury accommodation includes spacious en-suites, spa quality towels and bathrobes, Taylors of London Natural range toiletries, hairdryer, complimentary wine, LED Freeview TV’s and free Wifi. Breakfasts are prepared with locally and responsibly sourced ingredients from award winning suppliers and we can also cater for specific dietary requirements on request. Our residents lounge is relaxing place for our guests to chill or socialise outside of their room and browse through our library or perhaps have a game of Trivial Pursuit, Scrabble or Chess. Kick off those muddy boots after a walk and chill by the fire with a coffee and homemade cake. We can offer laundry facilities and bike storage for cyclists and are also members of the Walkers Welcome Scheme. Please note we are unable to accommodate pets with the exception of guide dogs. Children welcome from any age.